In 1981, I was teaching in the Public School system, ready for a major career change, and had no idea which direction I wanted to go. At that time, a friend who was an Organizational Consultant suggested I shuffle off to Buffalo, New York to attend a weeklong program at the Creative Problem Solving Institute. She had taught the Osborn Parnes, Creative Problem Process (CPS) at the Institute one week each June for a number of years. She described how it opened people’s minds and hearts to “possibility thinking.” It had changed her life and become the foundation for her consulting business. I decided to give it a try. During that week, I learned the importance of divergent thinking to vision the future, open my mind to new ideas, and “play” with many options before judging or making decisions. Also, I learned the importance of convergent thinking to make well thought out decisions using specific, objective criteria. And, I learned a process for putting it all together by creating a clear, step-by-step action plan. That week, I applied the CPS to vision possibilities for my life and my career, and I created an exciting plan to implement when I returned home. Part of that plan was to go back to school to get a Master’s in Management while teaching part-time. Then, I began to collect descriptions of jobs from newspapers that best described or resonated with my visioning work. I started a small, support / networking group of like-minded women who were seeking to transform their work lives as well. We helped each other articulate our dreams and stay on course. Later, I used the opportunity of my thesis to write on “organizational effectiveness,” which was the field I knew I eventually wanted to be in. After completing my Master’s, I began to work in a number of jobs, which led me to the work I do today. Each year, I went back to the Creativity Institute in Buffalo to learn more and then teach in their Leadership Program where I continued to develop my facilitation skills. In less than 8 years, I was clearly living the vision I had described in my plan! The life / work planning process I used had been so successful for me that I began to refine it and lead others through it as well. I work with both individual clients and with groups. Colleagues began to coin it FutureScaping! For almost twenty years, I have coached / facilitated over 100 people through the FutureScaping process. When a client begins, I send out a questionnaire to help them think about dreams they had for their lives; and I ask them to complete the Myers Briggs Type Inventory (MBTI) online before our meeting. This instrument is helpful identifying personality preferences that can help determine career and life choices. Then, we set up a time to meet for a 4-6 hour session depending on work they have previously done in their planning process. That meeting is usually in person, although with the use of Skype and an interactive, visual software program, WebEx, we can have a powerful remote coaching session online! The process is an in depth inquiry. What is currently working in your life? What values have been driving you to be where you are now? What is your vision for your ideal work / life? Which parts of that vision do you want to make happen? In what ways might you achieve those goals? What resources might you need to make it happen? When are you going to achieve each step? At the end of the session, the room is lined with flip chart sheets filled with data about the client’s life. There is time for reflection and learning on what they see. Pictures are taken so we both will have documentation of the work. Then, we set up a time within 2-3 weeks to have our first follow-up coaching call. Additional follow up coaching can be scheduled to keep the client aligned to their plan. One of the techniques used in FutureScaping is constant probing of what the ideal situation (job, life, transition) looks like, acts like, and feels like. We get very, very concrete and specific of what that vision is . . . as though it is happening in the present. Questions are asked such as, What are you actually doing? How are you spending your time? What are people saying about you? Etc. Being that precise elicits detailed descriptions and helps pull out the hidden desires behind the goals. The thoroughness of the action plan is vital. It has to be very deliberate and detailed, and all next steps need to be documented with a completion dates. The plan becomes the coaching tool for moving forward. In addition, other next steps might be assigned. Clients may leave the session knowing they need to collect more information and data around their goals. It might mean interviewing others, journaling, or creating a collage of pictures and ideas to gain clarity on what their ideal future state looks like. Again, ongoing coaching can help keep clients focused on their plan. People often ask, what is the magic behind FutureScaping. The “Law of Attraction” states that we attract into our lives whatever we think about. Our dominant thoughts will find a way to manifest. 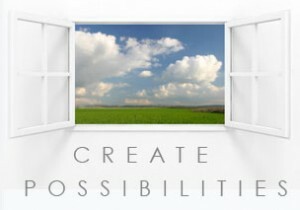 When we are conscious of our thoughts, vocalize and document them, it clarifies our vision and magnifies our intentions. Like a laser, that energy focuses pointedly on the future we want to create. The power of that energy and focus is immeasurable and unlimited – it is truly the Creative Force that manifests our future!